Since the use of medicinal herbs plays an incredibly important role in the process of human body recovery, Bioli employs specialists who utilize their professional knowledge by gathering medicinal herbs in country’s alpine zones, located on the southern slopes of Georgia’s mountainous regions. 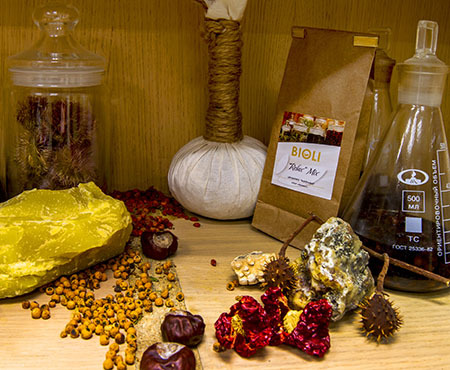 Medicinal herbs are natural antioxidants, and at Bioli, they are used both in therapy and in our specially prepared healthful meals. The unique and proper combination of plants enhances our ability to make a targeted impact on the human body. Each bouquet is a collection of carefully selected ingredients. The aroma of flowers and grass charged with the Sun’s positive energy throughout the day, makes each Bioli mix special. 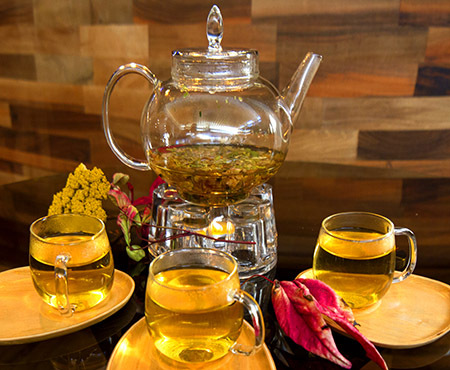 With the unique combination of plants we have come up with several mixes (“Detox”, “Relax”, “Antistress”, “Energy”, “Bioli Bouquet”, “Immunotea”) that have an intended impact on the human body. Besides the pleasant scent and tasteful features, they also have a therapeutic effect. A menu enriched with endemic phyto-elements provides an anti-oxidative effect on the body, improves metabolism and boosts the immune system. Such a menu also has a detoxifying effect. Medicinal plant baths are among the safest treatments - their use helps to increase the body's defense capability and its sustainability against the impact of adverse factors. Phyto-baths quickly provide relief from stress, calm the nervous system, rejuvenate and cleanse the skin, regulate sleep and improve metabolism.